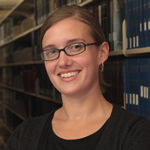 Erin Schlicht joined the University of Minnesota Law Library as Access Services Librarian in early 2010. Prior to that, she spent five years as Circulation Supervisor at the University of Wisconsin Law Library. Erin earned an MLIS from the University of Washington and a BA from the University of Wisconsin. She is an active member of the American Association of Law Libraries (AALL), as well as the local AALL chapter, the Minnesota Association of Law Libraries (MALL), and serves on committees for both organizations.